Edmund John Hilary Sylvester was born at Trowbridge, Wiltshire on 13th January 1914 and attended Harrow School from 1928 to 1930. He was commissioned in 501 Squadron, Auxiliary Air Force in January 1939 and called to full-time service on 24th August 1939. Sylvester went to France with the squadron on 10th May 1940. He shared a He111 destroyed on 12th May with F/O Rayner, this was A1+HK of 2./KG53 which came down at Beaumont-en-Argonne. On the same day he shared in the destruction of a Do17 with Sgt. PCP Farnes 30 miles NE of Betheniville. On 24th May Sylvester’s Hurricane was damaged by anti-aircraft fire in a patrol over the Soissons area. He failed to return from a patrol the following day, being last seen diving down with his engine smoking about five miles NE of Abbeville. Sylvester turned up the next day, having made a forced-landing after his aircraft was damaged by return fire from a Do17 and flak. Sylvester had badly damaged the Do17 in a combat over Dieppe at 15000 ft. His Hurricane L2124 SD*H came down at Limesy. On 27th May Sylvester claimed an enemy aircraft destroyed in the Abacourt area. Sylvester possesed Caterpillar Club badges for parachute descents on 3rd June and 14th June. 501’s records are incomplete for this period but that of the 3rd may be for the loss of Hurricane P2867. That of the 14th – ‘15 miles NW of Evreux’ is undocumented though undoubtedly genuine. The squadron was withdrawn from France on 18th June and reassembled at Croydon on the 21st. Sylvester was lost on 20th July in Hurricane P3082, shot down by Lt. Zirkenbach of I/JG27 into the Channel in the Lyme Bay area. 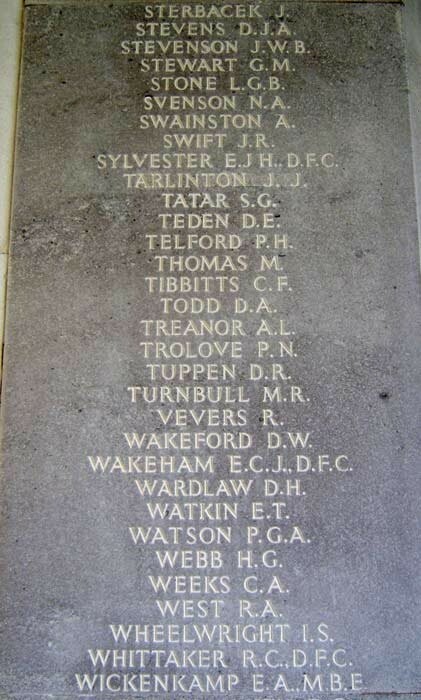 He is commemorated on the Runnymede Memorial, Panel 10. Sylvester was awarded the DFC (gazetted 25th April 1941) with effect from 27th June 1940.